Your winter needs, party needs and tropical-vacation needs are all covered this week, friends! Did you see this dress in the window this past week? Someone came in and asked about it, I ask what they like about it. Is it the colour (because we have LOTS of red dresses in right now)? The answer came back: it’s the bow! Flat, pointed-toe oxford from -you won’t believe it- Frye! Flats from Frye have been totally off my radar, but now I'm all about it! These ones are having a great time hanging out in the shoe section next to their cousin the Veronica boot from last week! So the black studded wallet/pouch is, no surprise when you think about it, Betsy Johnson! The lovely blue one is Marc Jacobs. You need to come to the shop to feel these IRL, because they are both made of the softest, buttery leather! I love this style of classy sandal! The minimalist straps and the low block heel are singing my song! How great is this skirt?! The simple shape is perfect for the busy carpet-bag style print, and do you see the two square front pockets? 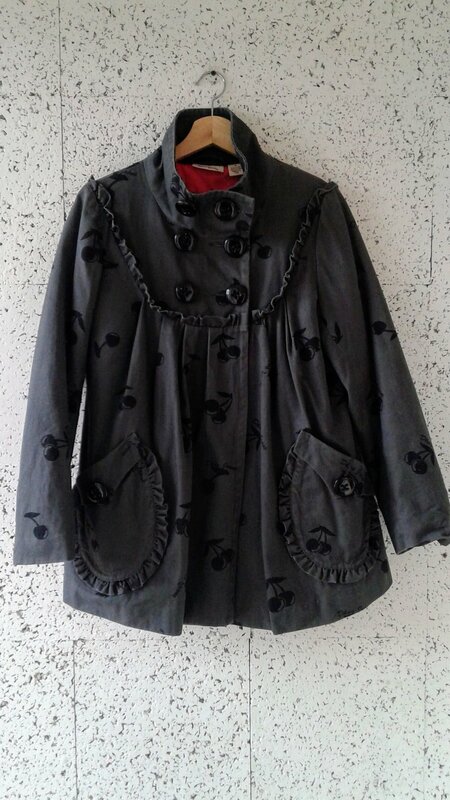 This simple, wool cocoon coat is from chez Simons. Here we must pause for a moment to remind ourselves that a true friend is not necessarily one that always reads your blog, but one that will tell you that look like you are pregnant in this coat. (I would say “thanks Laura!”, except that my long-time friend Laura doesn’t read the blog. Hmph). If you come in and try this coat on, I will definitely be honest with you about if you look like you are pregnant in it or not. I will also read your blog, because I am true friend. 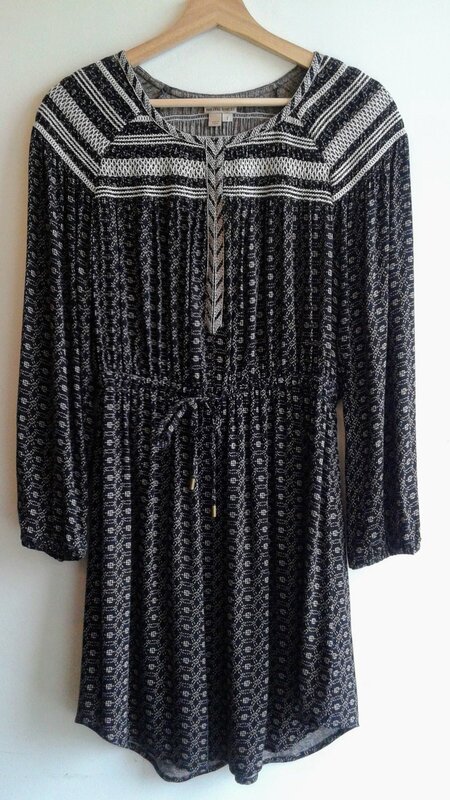 This flowey dress is so lovely and I was worried it would photograph poorly, but I think the playfulness of the print and its forgiving silhouette come across really well here! This Linea Pelle purse has great structure to it (it stands up by itself!) and the front flat folds up in one easy motion! 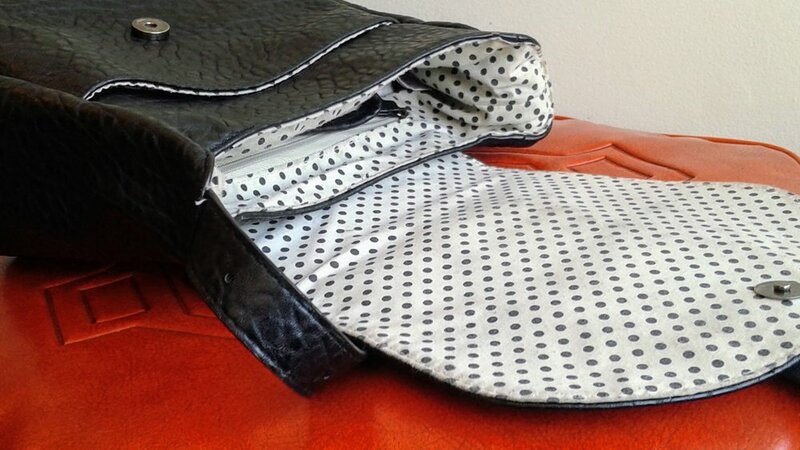 And then there’s the delightful dotted lining! A joyful rush each time you open it! Lately I’ve totally been into the cropped sweaters. I love how chunky this one from French Connection is! For those of you potentially heading somewhere warm in the next little while (lucky ducks! ), a delightful swooshy skirt…. …and a fun, vintage cut, pink polka-dotted dress! For those of you who pay close attention to detail, did you see the reflection of the sales section in the button?! (1) I had to love the glasses even when they are just sitting on the shelf. They have to be a work of art. (2) No one else in Edmonton could have the same glasses. I am very narcissistic and insecure, friends, and I need to have glasses and a haircut that no one else has! Our Laura immediately understood the artistic direction I was taking with my eyewear needs, and gave me lots of options. She even took great photos of each of the finalists for me to take home to solicit opinions from my friends. The WOOW glasses (bottom left) were definitely the most *different* of the final four pairs. For technical reasons, we couldn't pop the display lenses out of the WOOW glasses, so it was harder to get a feel for what they would look like on, and more of a risk, but when Our Laura said "No, you won't run into anyone else wearing these glasses!" I was all "yesssssssssssss". Good Mood! 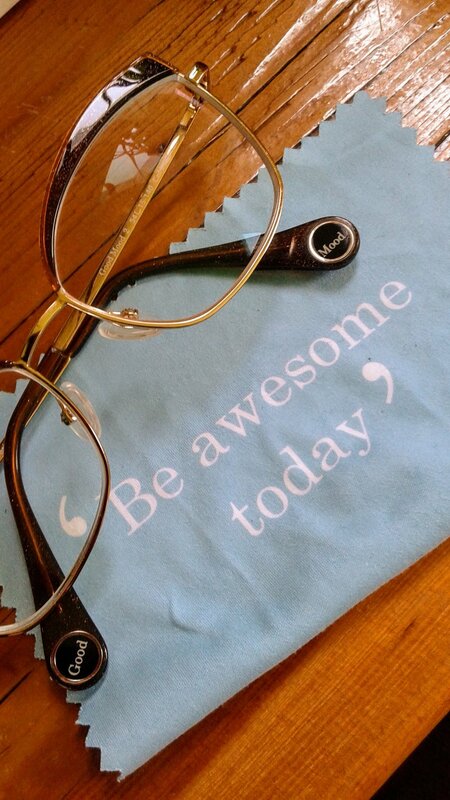 Be awesome today! I love these when they are on the shelf, and I get lots of compliments! So that's the story of my glasses, The Observatory and how Our Laura enabled my neurosis! OK friends, time to emotionally prepare because there will be no blog for the next three weeks. Hopefully you'll be having so much fun drinking egg nog at work, taking extra long lunch breaks and leaving 20 minutes early every day (it's the holidays, people!) that you won't notice. But I'll still be in the shop this Saturday and Sunday, so you can come by and we can talk about eyewear and all the stress-knitting that needs to get done in the next two weeks! I wrote this at The Ritchie Market, another independent, locally owned business. When we support independent businesses, we make an immediate positive impact on real human beings in our community!